Getting a lot cleared for commercial purposes, whether it is for new development construction or the restoration of a lot, requires hiring a company that has the experience and equipment to undertake a massive project such as this. Thankfully, there are commercial tree service experts who can handle commercial lot clearing, but you need to have some questions ready before deciding on who to go with. You want the job done right, on time, and on budget, so a little bit of pre-planning on your part will help ensure those three things are accomplished. Commercial lot clearing usually requires specialized equipment. Make sure the commercial tree service company you go with has the necessary pieces of equipment to perform lot clearing jobs safely and efficiently. You aren’t expected to know the names of the equipment used because that is their specialty, not yours, but an example you can use is a brush hog mower. This equipment is ideal for lot clearing projects that require maneuverability. The brush hog mower can grind small shrubs and forest understory, making it a perfect tool for tree clearing services. It will also open up existing woodlots if hiking trails are needed, for developments, and eliminating weeds that have run amok. Even just knowing the name of one piece of equipment will help start the conversation and show them you have done some research. 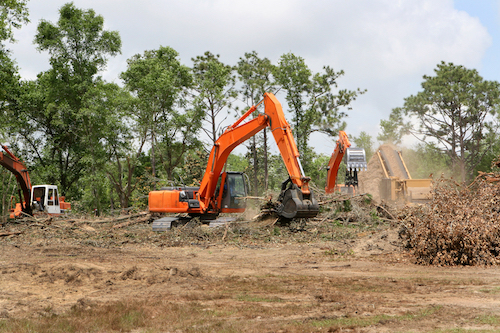 So be sure to ask what equipment they plan on using for your specific commercial tree clearing project. One of the most important questions you need to ask prospective companies for commercial tree service is if they do the following services as part of the job, and if not, who they plan on subcontracting the work to. And if they are subcontracting any part of the labor, you definitely need to know if that is all covered in your estimate and final quote, or if they will be billed separately. If so, you need to get quotes for those other services as well. The services to ask about are: tree removal, hauling of the debris, stump grinding and removal, backfilling, log hauling, and selective logging. Below are other questions that you to ask when looking for commercial lot clearing. Have they done jobs like this before? As with anyone and any company you hire, it is perfectly fine to ask them upfront if they have done this type of work before, and even ask for specific projects and names. You want to ensure that the company you hire has a successful history of commercial lot clearing. Residential lot clearing is not exactly the same thing and requires different techniques, so be certain they mention commercial lot clearing. If they haven’t done this type of work, you might want to pass and move on to a company that is highly qualified and experienced. Tree clearing is a science and doing it in a way that minimizes expenses and the environmental footprint is an art requiring talent and know-how. Do they have the proper licenses and registrations? Proper licensing and insurance is extremely important so there is no liability on your part in any way, and because you want the peace of mind knowing the people in the company you might hire are properly trained and have the right certifications for this type of work. Many commercial tree services and procedures require special skills, equipment, or techniques so having the right people do the job is of paramount importance. Ask if your potential contractor has all the necessary forms, including insurance and workers’ compensation. Is equipment up to date and serviced on a regular basis? This might seem like an odd question, but honestly,it is as important as anything else when considering who to hire. The company that has nothing to hide and who does maintain equipment will be proud to share that information with you, because safety should come first and part of safety is ensuring equipment is maintained to standards at bare minimum. How long will the project take and does the time of year make a difference? The need to know how long the work will take is a fundamental question to ask. If you have a timeline, then mention it and see if they can accommodate. And see if a winter project takes more time because of potential ground freeze. Will subcontractors be used on the project? You will want to know who is doing the work you are paying for, so if the company hired uses subcontractors it is well within your right to know who these people or other companies are. The information should be made readily available. How will fees be assessed and broken out? Discuss the fees and ask to see a breakdown of how they are assessed, and how payment will be structured. If subcontractors are being used, ask if those fees are billed separately or if they are included in the total invoice. You don’t want surprise fees. What preparations need to be done before the company comes in? You need to know if there is anything you need to do before the company comes in because if there is and it hasn’t been done, those can possibly result in further fees and put a dent in the initial timeline for project completion. What references can they offer? Always ask for references because it will help you determine if others are happy with the work done, and if the work was done to budget and on time. It’s the same as hiring any other company. If they balk, there might be good reason for it and it is best to move on to another company who will happily fulfill your request for references. Is cleanup included in the fee? Commercial lot clearing can be a messy affair, so ask if cleanup is part of the quotation and, if not, find out if they do it for an extra fee or if they subcontract the work out. The last thing you want is for the company you hired to pack up and leave you with a mess that needs to be handled. Looking for assistance with commercial lot clearing in the Portland area? Contact us at Mr. Tree.